Greater government involvement in design can be an opportunity - if done correctly. That requires architects to be to be at the table from the beginning. In this time of economic crisis the lines between the public and private sectors are blurring. The federal government is considering nationalizing some banks and bailing out the automakers. And with billions of dollars to be invested in building and infrastructure projects through the stimulus, government involvement in the design world will grow. Some people may think of the worst public housing projects or schools that look like prisons and be fearful. In many government-funded buildings of the 1960s and 70s, a misguided functionalism led to low-aspiration architecture. Form followed function but it also very obviously followed price. A subsequent reaction to that period led to a view that all government involvement in design is automatically bad news. But in fact, greater government involvement in design can be an opportunity – if done correctly. That requires architects to be involved and to be at the table from the beginning. 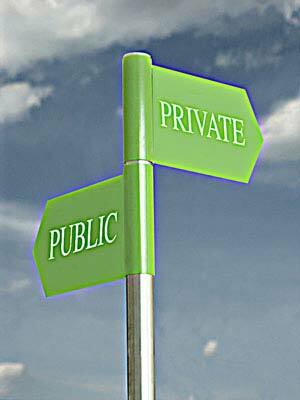 One way to think about this new public/private design paradigm is to picture the public as shareholders. In some cases that may literally be the case. What should we-the-people require in return for our investment? For the banking sector, elected officials are demanding that banks receiving public money should limit executive compensation and agree to renegotiate homeowners’ mortgages. What design demands should we make for construction projects receiving public money? The first and most obvious is sustainability requirements. This includes making buildings energy efficient and designing to green standards such as the Leadership in Energy and Environmental Design (LEED) ratings administered by the U.S. Green Building Council. Buildings produce 48% of the country’s greenhouse gas emissions, so better design can make a significant contribution to combating climate change. Leading by example and the sheer size of the government’s contracting power will help make any new government sustainability practices the industry standard. And exciting new sustainable design in buildings funded by the stimulus can be a catalyst for economic and social development in many neighborhoods. But sustainable design should extend beyond better insulation and the latest solar panels to a more holistic sustainable approach, including location. For example, the government should give preference to buildings located near public transit or that re-use brownfield sites. And the public needs to be engaged and involved. In a 2008 survey of 10 large U.S. cities conducted for RMJM by Zogby, fewer than half of respondents were aware of sustainable or “green” design alternatives that their city government is implementing. A second demand the public should be making is that we get our moneys worth. In other words, the projects will help reshape our economy in the long term. Investments in high-speed rail are a good example of this, but we should also think in bigger picture terms than simply whether an individual project (a road or a bridge) will help the economy. For example, we should be investing in projects that help grow and develop the country’s knowledge capital. Several regions are developing innovation expertise, including Boston, San Francisco, Philadelphia, New York, San Diego, Seattle, Raleigh/Durham, and Washington DC/Baltimore. The intellectual capital being nurtured in these developing innovation campuses are a vital national resource in ensuring our continued economic competitiveness. Design can play an important role. Architects are designing state-of-the-art science and research facilities across the world from Europe to Singapore to China. The U.S. government must ensure that public dollars are going to design facilities that can help the U.S. leap ahead in science and research. And these kinds of innovation campuses are another great example of the public and private sectors collaborating and cooperating. Many American cities already have great synergies between their universities and their hospitals. That kind of fertile ground for innovative thinking needs to be nurtured. And architects need to be at the table to do so successfully. Architects know how to capitalize on the resources that are there and to see the potential of the unbuilt. The perspective of combining the programmatic and the aspirational has been missing from government-funded design. That perspective is vital – and only architects have it. Peter Schubert, AIA, is the North America Design Director for RMJM, an international architecture and design firm. Based in the firm’s U.S. headquarters in New York City, his projects include 111 Central Park North in New York, LG Electronics Seocho R&D Campus in Seoul, and Duke University-National University of Singapore Graduate Medical School in Singapore.